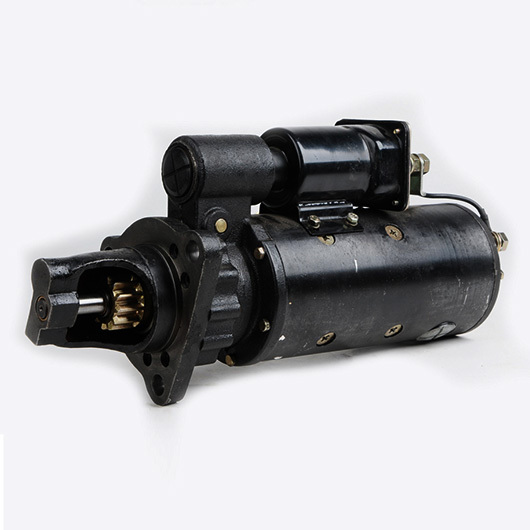 Diron sale high quality cat and komatsu aftermarket Starting Motor to replace high cost original parts, the replace Starting Motor used for heavy equipment cat, cummins, komatsu. Heavy equipment replace Starting Motor dealer from china. In general, the starter uses three components to implement the entire startup process. The DC drive motor introduces the current from the battery and causes the drive gear of the starter to mechanically move; the transmission mechanism engages the drive gear into the flywheel ring gear and is automatically disengaged after the engine is started; the on / off circuit of the starter circuit is Electromagnetic switch to control. Among them, the motor is the main part of the starter, its working principle is that we in the junior high school physics in contact with Ampere's law based on the energy conversion process, that is, the role of conduction in the magnetic field force. The motor includes the necessary armature, commutator, pole, brush, bearing and housing. The engine must be rotated by its own force before running its own power. The engine by the external force from the static state transition to self-running process, known as the engine start. Engine commonly used to start the way there are manpower start, auxiliary gasoline engine starting and power start three forms. Manpower starting with rope or hand way, simple but inconvenient, and labor-intensive, only for some low-power engine, in some cars only as a reserve way to retain，auxiliary gasoline engine starting mainly used in high-power Diesel engine.